Overall, this has been a great year for wildflowers, and summer looks like it will be no exception. Unlike last year, when many areas were dry, rain has been frequent enough to keep summer wildflowers blooming in showy displays. And the good news is that the NOAA Climate Prediction Center is forecasting normal summer rainfall throughout Florida. While the outlook is promising for wildflowers in general, the potential exists for exceptional displays of summer wildflowers in moist and wet areas because of frequent rain. Look for these displays in rural ditches and swales where reduced mowing has been implemented, especially in counties that have officially adopted a Wildflower Resolution – a pledge to encourage and implement practices that conserve and promote roadside wildflowers. For more information and a map of counties that have Wildflower Resolutions, visit Protect Roadside Wildflowers. In natural areas, look for vivid displays in pine flatwoods, especially those that are regularly burned. What makes moist and wet areas so good for summer wildflowers is the diversity of color of showy common species, nearly all of which occur statewide. 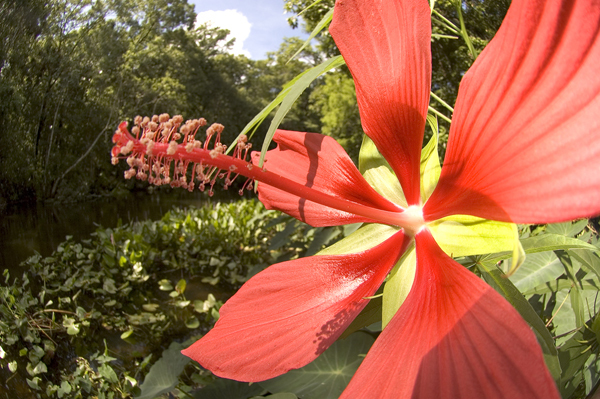 The bright white of Crimsoneyed rosemallow (Hibiscus moscheutos; northern Florida only), Giant whitetop (Rhynchospora latifolia; the showy parts of whitetop sedge flowers are bracts) and Starrush whitetop (Rhynchospora colorata). Get out soon to look for early summer-blooming wildflowers. Flowering seems a bit early for some bloomers, based on what’s been seen in the Panhandle and northern peninsular Florida. Botanist Nancy Bissett of The Natives in Davenport has noted the earlier-than-normal seed ripening of some species in Central Florida, which may be an indicator of shorter blooming periods for some wildflowers. Thanks to Nancy Bissett, Bob Farley, Roger Hammer and Claudia Larsen for the helpful information they provided.